People do not have the knowledge, O Rama, of the path of devotion. They wander all over the world babbling but they do not have the knowledge of devotion. They get up early, take a dip in the water, smear themselves with sacred ash, count their prayer beads with their fingers, outwardly very praiseworthy! Inwardly they are dedicated to making money. But..they do not have the knowledge of the path of devotion. ‘I am an atheist’ my son tells me. It is Deepavali day and we are at the temple. My son’s statement is not a surprise; I am aware of his thoughts. Yet..
‘It makes me so sad’ I say. Generally speaking, my tendency is to say ‘each to his own’. I feel very unqualified to judge people for the choices they make. Who is to know what is right? Yet in this case, it feels different. I see this as a my failure. As a mother, I should have made a better effort to teach him of a belief system which has given me much succour over my lifetime. I say as much to him. ‘Are you so sure of being right then? What if you are wrong?’ he asks. I acknowledge that it is not really possible to prove the existence of God. At some stage, one has to take a leap of faith. Yet there is this feeling… I think it is like music appreciation. There is all this wonderful music, soul touching music, our world of Carnatic Music. Thousands pass by its path, unaware, untouched. Even amongst those who listen with great interest, only rarely does the music ‘speak’ in such a way that one’s soul merges with the music. The transmission may be there, but if one doesn’t have a receiver, one hears nothing! For music and for devotion, one needs a receiver within oneself, or so I think. ‘teliyalEru rama bhakti mArgamunu’ I tell myself as the title of the song comes to mind. I search for a translation to see that Tyagaraja speaks of something a bit different – not about the lack of faith, but about putting on a grand but false show of faith. Tyagaraja seems saddened. ‘They can never know, O Rama, the true path of Bhakti’ he says. ‘They get up early, take a dip in water, smear themselves with ash, count their prayers on their fingers, but all a grand show for appearances’ says he. It seems far worse than a honestly stated atheism, doesn’t it? For full lyrics and translation, see footnote. The song is set to raga Dhenuka; to know more about this raga, click here. I have been in the mood of yesteryear greats as last week’s post demonstrates. I have listened to many renditions these past few days but keep going back to the one by Semmangudi Srinivasa Iyer which I present below. Sound quality is not very good but the music is exceptional. For an instrumental version, here is a elaborated rendition of this song. I found it very interesting as elaborations of this raga are rare. Again sound quality is below par but definitely worthy of your attention. I do not speak Telugu. I am indebted to various internet resources for the lyrics and translation below. People do not have the knowledge, O Rama, of the path of devotion. People get up early, take a dip in the water, smear sacred ash, count the prayer beads (implied) with their fingers, outwardly being praiseworthy. Inwardly (implied) they are dedicated to earning money. But, O Lord praised by Tyagaraja, (they do not have the knowledge of the path of devotion). Touching post. I can completely understand and can only praise you for an extremely mature outlook – how many would take the view that you have. And yet a touch of poignancy is inevitable. But as you say, it is far better than the mindless ritualism of the so called devoted. I had always thought the lyrics was in the first person – the Saint himself bemoaning to Lord Rama that he doesn’t know the path of devotion. Now I know that he is bemoaning the devotees only in name instead. Every post of yours, I learn a bit. Not sure if Srinivas falls under the veteran category or the youngsters category as he has been performing for a long time, being a child prodigy. Scintillating music he delivers, especially on kritis in praise of Rama. Hi Ramesh, I am not alone in being a parent whose views are very similar to their children. I accept that it is the way of life as it stands now, especially in the so called developed world. I too thought that it was Tyagaraja talking to himself until I examined the translation..it was a learning for me too! And as for Shrinivas, he has indeed been performing for years but no, I don’t think he quite an ‘elder’ as yet! A master of his instrument, without doubt. Sorry not to have written more recently: I get all your posts though! What you say about transmission touches me a great deal. My children too have one by one drifted away from faith and religious practice, and some of them have also served the scathing words ‘I am an atheist”. I too have wept inwardly at not having been true enough to my truth, so that it would shine outwardly and brightened their lives with the glory of God. Well, time has now passed, and the force of these emotions has slightly subsided, and perhaps I can share with you the present situation. First I think that children, like all human beings, need to pass through the refusal of what they have been given, in order to lay whatever foundations will serve them later, which they will be able to accept as being their own, and nobody else’s. So if one day, the seed you have sown in their heart blooms, they will be able to recognize it as coming from their inner sanctum, and will then admit its presence. This might seem less humble than recognize that the generations before you were right and embrace their truth unquestionably, but I think there is a rationality in this (more) self-centered attitude, and anyway, we hardly have the choice. Forcing somebody to believe is not an option. Then, I also believe that whatever route they choose, your children will always look towards you as an example; and your faith will always be there as a question mark in their lives. So the worst you can do is let yourself influenced by their need for difference and autonomy (you don’t do that, I know, I’m speaking in general terms). One more thing: I know that Life is greater than parents and children. Children one day will have children of their own, and ordeals of their own; and the great question of meaning will assail them just as much whether they have decided that “atheism” was their comfort zone or not. They might not necessarily, then, answer this question with the answers you had provided them when you educated them. But they will know that you, for one, had dared commit yourself and define yourself as a believer, and if they’re wise enough, they’ll recognize the value of this commitment. Finally I believe we’re not the only ones who shape our children’s lives. The Spirit in which I have put my trust is by far more patient and knowing than I am: who knows how It plans to suggest the truth to the billions of free souls that exist? Dear Yves, It has indeed been a long time since we communicated over each other’s blog posts. You are very kind to have taken the time to write these words of solace to me as a fellow parent facing the same issues. I am very touched; it is indeed comforting to know that I am not unreasonable in feeling this sadness and pain, and that it is a shared experience. I have read somewhere about what you say re the psychological development of children when they try to establish their own selves. I respect that and never have forced my views of my kids. But I don’t think my mother forced her views on me either – the devotion was there in her, I was drawn to it – I remember being as young as 7 or 8 when I had my own first conversations with God. It is just that my devotion was less overt than my mother’s. Being somewhat isolated in a new country of a different faith and being work-focused, my belief was very internalised and so was not part of the daily life as it was for my mother. Perhaps that is the reason that my belief was not ‘catching’. And you are very right when you say that the God you believe in will take care of it in His own time, in His own way. What makes me very sad is something very selfish and self-centred. My son is a wonderful boy, in all ways commendable, the best that any mother can hope to have. In fact, I would have no other in the whole world except him. So you see, I do not fear for his soul in anyway – how can anyone SO good be in anyway ‘Godless’, whatever he says he is? But – this is the self-centred part of the feeling – devotion is a big part of my own identity, It is who I am, Suja-the-mom-who-loves-painting-and-music-and-is-devoted-to-her-Gods – that is my definition of myself. By rejecting my faith, I feel as if my son has rejected me. This is of course stupid of me, but there it is – I feel rejected. And that is hurtful and sad. Oh well. One more lesson to learn from life. Your children are much younger as I recall. Perhaps theirs is just a passing phase. I hope so. 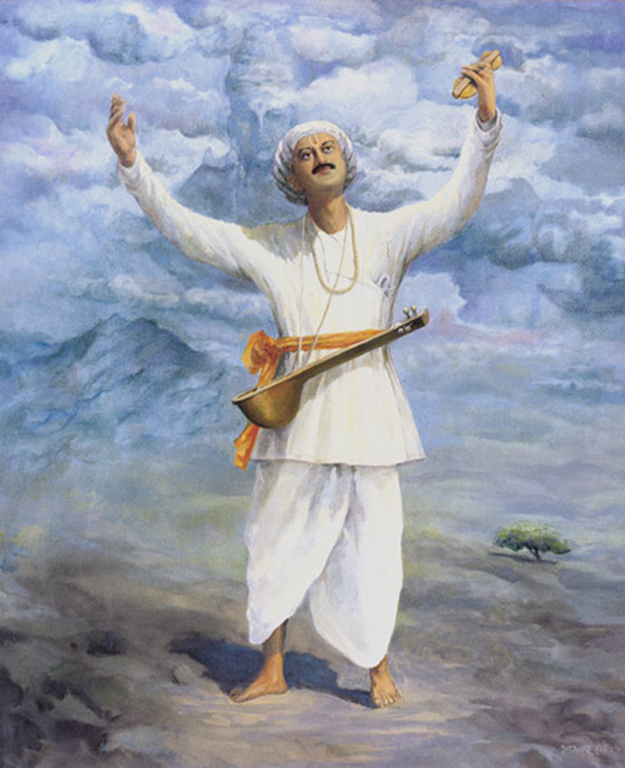 PS: The illustration accompanying Teliyaleru Rama looks like Sant Tukaram! Hello Chandramouli, It is interesting that Mata Amritanandamayi has no issues with atheism..I would have thought differently! So your son is another young man who is refusing your faith. In Srimad Bhagavatham it is said that in Kali Yuga ‘The path of the Vedas will be completely forgotten in human society, and so-called religion will be mostly atheistic’. So perhaps this is just a symptom of Kali Yuga, the number of our young who are atheistic. Much as we are saddened as parents, we have to accept that each one of us has to live our own karma. This song is known to me and so I could relate and thanks for pointing out that ‘karunai kadale’ also is in the same raga. The meaning is close contextually to a verse from Sankara’s ‘bhaja govindam’: jatilo mundi, lunchita kesha, kaashayaambara bahurkrtha vesha … Here Tyagaraja identifies with the duplicity inherent in the vast majority of us when it comes to matter of faith. The word ‘teliya’ has the same meaning in Malayalam – i.e. clear, apparent, and obvious. In our mistaken view, we accord the highest regard and deference to our ‘intellect’ and reason so much so that anything that cannot be intellectualized must be not real. And of those who have recognized ideas of a supreme power/energy, something beyond us, they we have managed to create anthropomorphic mental images. Then we accord them with names such as ‘Krishna, Jesus, Allah…”. Those who have had the courage to delve deeper are the sages and thinkers. Some of the great saints have said – words fail me. Words are still one order separated from how we really understand this in our hearts. The Narada bhakti sutras say “anirvacananeeyam prema svaroopam”. The dialogues of Nachiketa or Svetaketu are probably inner dialogues one needs to have with our own selves, not very different from the “inner eye” construct employed by Wordsworth. It is through our experiences that one gets to ponder/contemplate, vicara, over these matters. Remember the phrase from Ghulam Ali’s famous ghazal “har saans yeh kehti hai, hum hai to khuda bhi hai” The Keno Upanishad boldly asks “srotrasya srotram manaso mano yad, vaco ha vacam…” basically – what’s it due to or due to what is it that the ear hears, the eyes see… Intellect with its ‘symbols and shibboleths’ can only explain so much. We like neat patterns to explain things. True faith is lost in rituals everywhere. That’s because rituals externalize our faith – as if our deepest convictions need some re-affirmation and then the whole ballgame continues ad infinitum. I don’t know if you have heard about a great music director who composed mostly for Malayalam movies: G. Devarajan. He was known to be an atheist. It’s a treat to hear his body of work. Some of his classic devotional songs such as “chethi mandaram thulasi”, “nithya vishudhayam kanya mariyamme” are considered masterpieces. Hello Jay, Thank you for your very interesting comment. I really appreciate your wide knowledge of so many different kinds of thoughts – from film dialogues and music to ancient treatises. Your comment about the similarly of the lyrics here with Bhaja Govindam is very interesting point for fellow rasikas interested in lyrics and meanings. Perhaps you have misunderstood my thought process; I have not labelled the post as ‘atheism’ at all. It so happens that I was ruminating on the path of faith due to my conversation with my son on atheism and hence I remembered the first line of the song (bhakti margamu). Hindu belief is in essence monotheistic but multimorphic hence it does not matter which form we choose to worship. However a lack of identifying this oneness of God while celebrating the diversity of forms is a common weakness. That does not mean that we need reject the forms. If the forms help one see the essence, why not take the help of forms? As also rituals – they are finally not for God but for us humans, aren’t they? If rituals help us focus our minds, why not use them? I am not ritualistic at all, still when I saw a abhishekam at Chidambaram temple recently, it was a transcendental experience, pathway to connect to the God within me. Sadly, many people focus only on the ritual or the form, forgetting that it is only an aid to make a connection with God. I will look up G.Devarajan’s music, thank for the recommendation. And no, I have not heard Charumathi Ramachandran, I will look her up as well. The medium of music with its expressive capability and poetry, captures our deepest and profound thoughts. Thyagaraja’s verses are profound. I was speaking in general terms about the sense of loss or disappointment that this particular song has revealed among the few folks here and to those who may have paused to consider how these matters play in their own lives. Ultimately, in such matters, each one of us has to come to finality in his/her own terms. It is probably through our personal experiences that many of the abstractions inherent in life come to form and substance. There’s no one way to compare or relate, and therefore arrive at a judgment, because the feelings borne in the recesses of our hearts are personal, our own, and can seldom be understood by the other. Probably no two persons who viewed the abhishekam with you at Chidambaram could arrive at the same sense of awe you experienced. Personally, I’ve heard of the ‘Chidambara Rahasya’ and someday hope for a darsan. I’ve often wondered in awe at the energy in the temples that has the capacity to draw such large throngs of the population. A few years back, I went to Sabarimala during the peak season for a darsan. It very, very crowded. It was my second visit after a gap of close to 30 years! The ascent was difficult but what I cannot explain is how I stood in the queue for more than 10 hours and throughout the 30+ hr journey never experienced any ailments. We had a brush with danger though. For those who have traveled on this road – they know the narrow winding way up with deep ravines. It was in the wee hours of the morning when the bus driver dozed momentarily and the bus hit a small tree on the left shoulder and came to a halt. Had it been on the other direction, where there was no shoulder, the bus would have fallen off to the ravine. Miraculously nothing bad happened excepting for minor injuries for a handful few. I am total agreement of what you say, especially your statement that ‘each one of us has to come to finality in his/her own terms. It is probably through our personal experiences that many of the abstractions inherent in life come to form and substance.‘. From that viewpoint, one can only hope that those young people who have claimed to be atheists now may find the pathway to theism in their own way and time. Your experience at Sabarimala is interesting. One is indeed in a different mental and physical state during these kind of trips, I think. The accident though..it makes me shudder! Suja, this ‘post’ from you – with your ‘open mind’ – so full of meaning and the hitherto rich comments from your followers and your response/replies to them have really taken this ‘blog-post’ to a high intellectual/devotional level. I am too short of wisdom & words to add to them! All I can say is I’ll keep looking for more of the exchanges on this ‘post’ and ‘chew-them-as-cud’ whenever I feel like! Of course Semmangudi’s rendering is very good. What can one bankrupt of words sufficiently say of the Composition/s of Saint Thyagaraja!? Hello Raj, I too found it very interesting to hear my readers experiences. That makes my own experience richer. And you are right – there are not enough words in the vocabulary to praise the work of our great composers! Here is Bala Murali Krishna’s version of the song, I am sure you will enjoy it. Thank you for the link! I have heard other renditions of BMK but not this one. An excellent recording. Love the Alapana, both the vocal and the violin. The quick swarams were interesting and unique. Funnily, there is so much pathos in the Alapana but the swarams give a more cheerful mood, don’t they! Loved the rendition of the Kriti as well. Great link, much obliged for the 20 mins of sheer pleasure! !